Sacagawea was the Shoshone Indian who assisted the historic Lewis and Clark expedition. Between 1804-1806, while still a teenager, she guided the adventurers from the Northern Great Plains to the Pacific Ocean and back. Her husband, Toussaint Charbonneau, and their son who was born during the trip, Jean Baptiste, also accompanied the group. The history of Sacagawea’s life is shrouded in mystery and myth. Much of what we know has been passed down through oral history by the Hidatsa, Shoshone and Comanche Indian tribes. Not a great deal is known about her as a young woman and even less is known about her later life. But what we do know is remarkable. At about the age of 11, Sacagawea was captured by a Hidatsa raiding party and taken from her Shoshone tribe. She was later sold into slavery with the Missouri River Mandans. They then sold her (or gave her away in a bet) to Toussaint Charbonneau, a French-Canadian fur trader, who made her his wife. Charbonneau was hired by Captains Lewis and Clark primarily because of the skills his wife, Sacagawea, possessed. Sacagawea was only 15 years old at the time and already six months pregnant. Despite these possible limitations for such an arduous journey she knew several Indian languages, and being Shoshone, could help Lewis and Clark make contact with her people and acquire horses that were crucial to the success of the mission. In fact, Sacagawea did help Lewis and Clark find the Shoshone and trade for the horses they needed. But her contribution far exceeded anything Lewis and Clark had expected. She provided crucial knowledge of the topography of some of the most rugged country of North America and taught the explorers how to find edible roots and plants previously unknown to European-Americans. With her infant son bound to her back, she single-handedly rescued Captain Clark’s journals from the Missouri whitewater when their boat capsized. If she had not, much of the record of the first year of the expedition would have been lost to history. Most crucially, however, Sacagawea and her infant served as a “white flag” of peace for the expedition, which was as much a military expedition as a scientific one. They entered potentially hostile territory well armed but undermanned compared to the Native American tribes they met. Because no war party was ever accompanied by a woman and infant, the response of the Native Americans was curiosity, not aggression. They talked first, and Sacagawea often served as the translator. Not a single member of the party was lost to hostile action. It is not surprising that after their trip ended, the adventurers felt a lifelong debt to Sacagawea. In fact, Clark wrote to Charbonneau that Sacagawea deserved a greater reward than what the expedition gave her. His sense of indebtedness to Sacagawea is reflected a few years later when Clark accepted responsibility for educating Sacagawea’s son and, after Sacagawea’s death at the age of 25, for a daughter as well. Sacagawea’s grave is in Lander, WY. Never in the history of the United States had the public played such a unique role in picking a design concept for a circulating coin. The Golden Dollar’s journey was as unique as the journey of discovery it commemorates. The Dollar Coin Design Advisory Committee (DCDAC) included a member of Congress, a university president, the president of the American Numismatic Society, the under secretary of the Smithsonian Institute, a sculptor, and an architect. United States Mint Director Philip N. Diehl chaired the committee in a non-voting capacity. In June 1998, the DCDAC convened in Philadelphia. It deliberated about the design concept in a public session. Outside input factored heavily into the Committee’s decisions. The Committee listened to 17 design concept presentations from members of the public, as well as to numerous mail, phone, and e-mail messages submitted by the public. On June 9, 1998, the committee recommended that the dollar coin bear the image of Sacagawea, the Native American woman who accompanied Lewis and Clark on their exploration of the American West. The artists received few guidelines but were told to be sensitive to cultural authenticity in creating an image of Sacagawea. They were also requested to create reverse eagle designs reflecting peace and freedom. After receiving designs from 23 invited artists, the United States Mint again turned to the public for input on the final choice. In November and December of 1998, the United States Mint invited representatives of the Native American community, numismatists, artists, educators, historians, members of Congress, United States Mint and Treasury officers and employees, and other members of the public to review and comment on all designs received. Using these comments as a guide, the United States Mint narrowed the field to six obverse and seven reverse designs. The United States Mint tapped into the power of the Internet. It published the design finalists on its web site and received a never-imagined response: Over 120,000 emails and 2,000 letters and faxes. In addition, the United States Mint shared the designs with Native American tribal leaders and other representatives, and with members of Congress. The United States Mint also conducted focus groups with representatives of the public and the numismatic community. In addition, historians advised the United States Mint on the historical merits of each finalist design. Using feedback and information gathered from these sources, the United States Mint narrowed the field further to seven final designs, three obverse and four reverse, before submission to the Commission of Fine Arts on December 17, 1998. The seven final designs were forwarded to the Commission of Fine Arts, which provided its recommendation to the United States Mint. After much review of all the input received to date, the United States Mint presented the final designs to the Secretary of the Treasury. On May 4, 1999, the United States Mint unveiled the selected design at the White House. 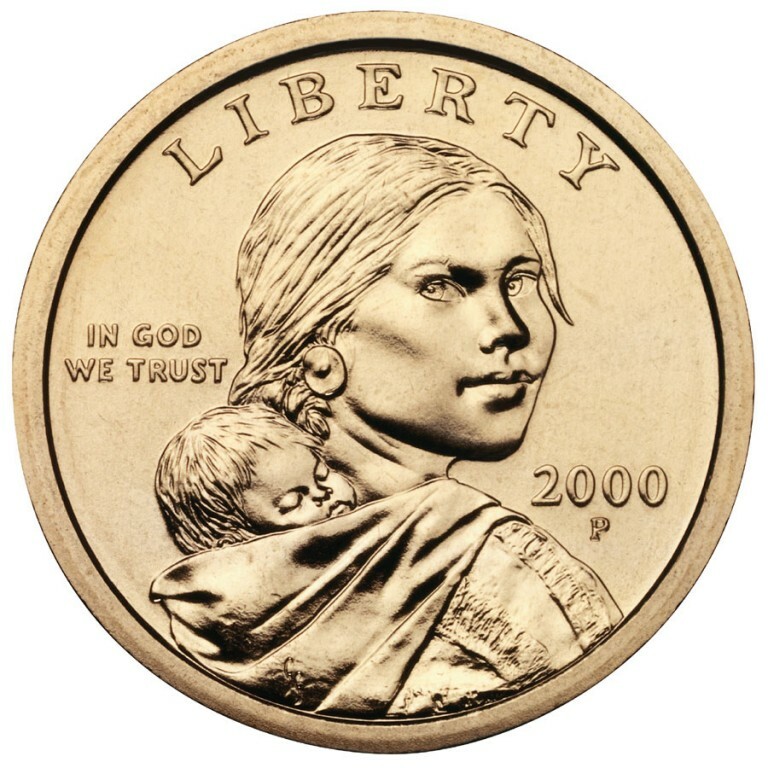 Glenna Goodacre designed the winning obverse image of Sacagawea and her infant son Jean-Baptiste for the Golden Dollar. Goodacre is well known for her portrait busts and figures and for her interesting sculptural compositions of active children. Her pieces are in numerous private, corporate, municipal, national, and international collections. Goodacre’s works are widely exhibited and have won several awards. Glenna Goodacre designed the original version of the selected obverse design (background) which was modified slightly, for minting, into the final design (foreground). Obverse must depict one or more women, but could not depict a living person. Reverse must depict an eagle. The coin should have similar metallic, anti-counterfeiting properties as current circulating U.S. coins. 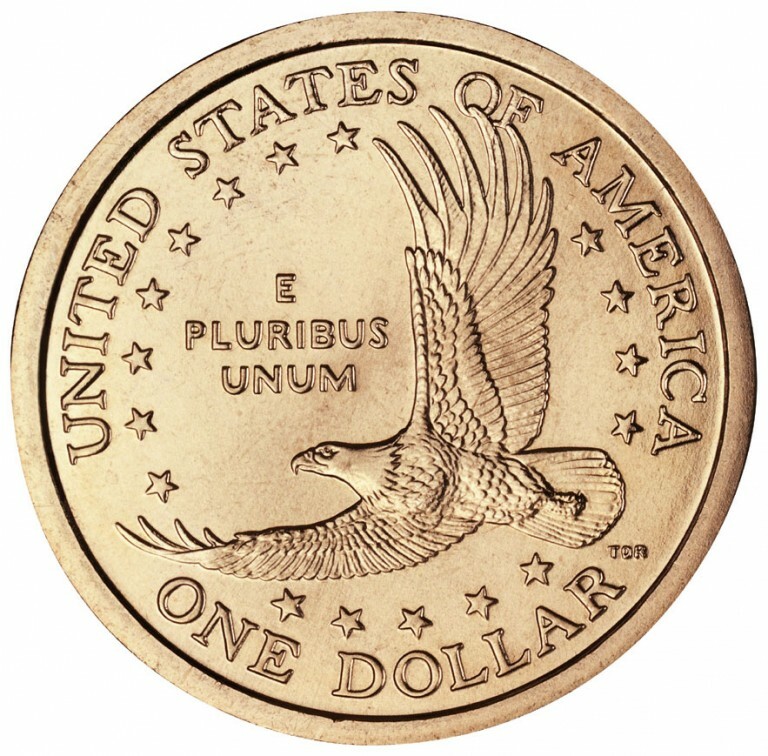 The Golden Dollar's obverse, or heads, has Sacagawea portrayed in three-quarter profile. In a departure from numismatic tradition, she looks straight at the holder. Glenna Goodacre, the artist of the obverse, included the large, dark eyes attributed to Sacagawea in Shoshone legends. Goodacre used a present-day Shoshone college student, Randy'L He-dow Teton, as her model. On her back, Sacagawea carries Jean Baptiste, her infant son. Six months pregnant when she joined the Lewis and Clark expedition, Sacagawea gave birth to Jean Baptiste early in the journey. Designed to successfully complement the obverse, the selected reverse features a soaring eagle encircled by 17 stars. The 17 stars represent each state in the Union at the time of the 1804 Lewis and Clark expedition.